Gerbera daisies are one of today’s most popular varieties of cut flowers for bouquets, centerpieces, and all-occasion arrangements. Belonging to the sunflower family, they come in such cheery hues as red, orange, pink, yellow, and white. Their large, open blooms are very “showy,” making them ideal for decorating a large area; plus they can be used on their own, no foliage necessary. Not only are gerberas vibrantly colorful, they are quite hardy as well. Their multiple layers of petals are not as delicate as those of other flowers, making them easy to handle during arranging and decorating. A striking combination like orange and green immediately says this is not your usual tea party. The choice of venue immediately sets the tone for the tea party. If the intended look is bright and cheery, clear options would be a garden or patio. Indoor locations such as a sunlit function room at a country club or a solarium overlooking lush botanical gardens would also work just as well. The key is the natural glow of afternoon sunlight, with its subtle changes as dusk approaches. Having set the stage with a sunny venue, play further on that theme with an equally bright color palette. Choose an unlikely combination like orange and green, and one immediately announces that this is a tea party with a difference. With orange and green making such a striking statement, the total look may be tempered with a background of light lilac and touches of blue. For those who may prefer something closer to a subdued teatime look, light orange or peach with mint green would provide a milder color palette, but still with an edge. Clear glass plates, crystal fish bowls, and glass beads reflect the vivid color palette of the table. Where do the gerbera daisies come in? They make their colorful appearance as part of the table decorations. In fact, it is their bold orange color that provides the energy of the party’s color palette, as they are laid in groupings of three or four around the table. Small glass bowls, each containing a single goldfish, add further life to the table as they echo the color of the daisies and serve as instant conversation pieces among the guests. White candles and daisy themed votives add dramatic lighting to each table as the afternoon sun begins to fade. To cast a modern take on a tea party, even the basics—flatware, napkins, and silverware—take a departure from tradition. Clear glass plates are used in place of china, and starched white napkins are tied in a roll with a lime green satin ribbon, a single orange daisy inserted into the knot. A final touch of green is added with glass beads dotting the table for added texture. These beads, along with the glass plates and fish bowls, capture and reflect the orange and green throughout the table. 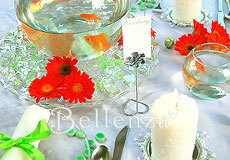 Groupings of daisy heads amidst the place settings set off an unusual goldfish bowl centerpiece. Keep the element of surprise alive in the rest of the table decorations. Instead of using daisies to form an elaborate centerpiece, cut off their stems and arrange the flower heads in groups of two, three, and four to serve as eye-catching accents amidst the place settings. Be sure to have the daisies stand in water for at least two hours prior to cutting to keep them looking fresh throughout the tea party. 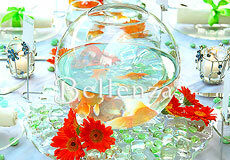 Even more unusual, create a centerpiece featuring a crystal bowl filled with water and live goldfish. The swimming fish provide a dynamic table display, as they also echo the event’s color palette. In place of goldfish, flower petals or candles may float inside the bowl, again complementing the chosen color scheme. Look for a bright and cheery location such as a garden, indoor patio, or a solarium. Choose a fresh color palette in orange and green. Decorate the table with bright gerbera daisies, while adding an unusual element such as glass bowls filled with gold fish. Serve up a menu befitting a tea party with light foods such as scones, fruit tarts, and tea sandwiches filled with smoked salmon and cucumber. 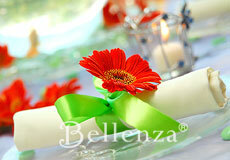 Give favors that evoke the design of the table’s decor such as lovely votives with a daisy motif. The delight of the unexpected is carried on in the treats served at the bridal shower. While tea party staples such as petit fours, scones, fruit tarts, and cupcakes certainly taste wonderful with tea, sharper, more tangy variations of these will provide a pleasant surprise. Cranberry orange scones, for example, would be a flavorful dessert to follow traditional tea sandwiches filled with slivers of cucumber or smoked salmon—which coincidentally are orange and green as well. The selection of teas served at this affair could likewise include ones that differ from the customary Earl Grey, Ceylon, and Darjeeling. For instance, prepare teas infused with the essences of mandarin orange, lemongrass, peppermint, raspberry, or even pineapple for more exciting flavor choices. 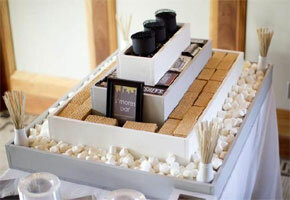 Or be truly inventive by setting up a tea buffet. Prepare a spread of fresh herb leaves such as mint, basil, and lemongrass; several teapots of piping hot water; slices of lemon, lime, and orange; and a pot each of honey and cream. Then invite guests to make their own cups of freshly-brewed tea, combining herbs as they wish. Such imaginative enhancements to the traditional tea party deserve an updated presentation as well. Think beyond dainty porcelain cups and heavy silver teapots. Instead, serve the tea in clear glass teapots and cups with flower etchings, reminiscent of the gerbera daisy. 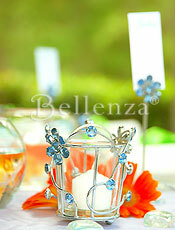 Votive holders with rhinestones set in a daisy design start off as decor elements, then become practical party favors. For a truly memorable shower souvenir, present miniature versions of the fishbowl centerpiece—goldfish and all—to the guests as they leave. Gerbera daisies, with their showy blooms and vivid colors, may be just the unlikely decor element needed to alert bridal shower guests that this is not your usual tea party. Combine their vibrant orange with elements in equally striking green, then reflect all these in glass tableware surrounding an unusual centerpiece. The result is a tea party with an updated look and a fun feel—thanks to the cheery gerbera. This is so colorful! 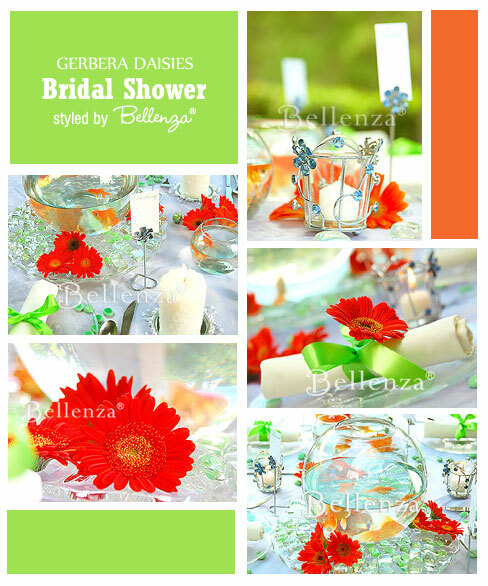 I first saw this idea from At Home with Kim Vallee’s blog and fell in love with the idea of using gerbera daisies as inspiration for a bridal shower. 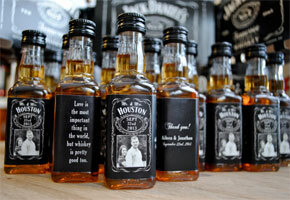 I’m actually planning to have this theme for my own shower and found the perfect cake idea to go with. 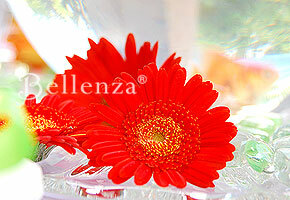 I plan to have individual cupcakes topped with sugar-made gerbera daisies in orange gerbera daisies. 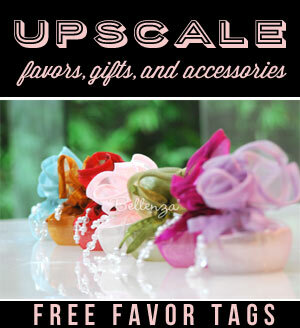 Check out some similar ones from Pink Cake Box’s blog. I’m having a spring bridal shower and this is perfect! So easy, too. I’m so happy to see this! I am planning my sister’s baby shower based on Dr.Seuss book “Fish out of water!” Those goldfish in glassbowls will be our centerpieces. Time to use some goldfish from my brother’s aquarium!! !